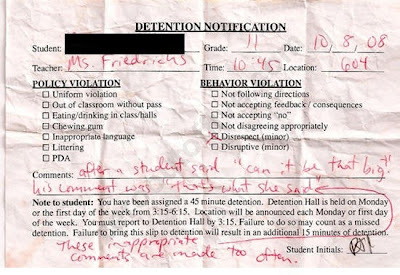 Detention Slip Week: that's what she said??? Comments: after a student said "can it be that big" his comment was "that's what she said". These inappropriate comments are made too often. It's kind of ironic that this student was sent to the office for saying a statement popularized by the TV show The Office. I guess the teacher doesn't have a sense of humor.